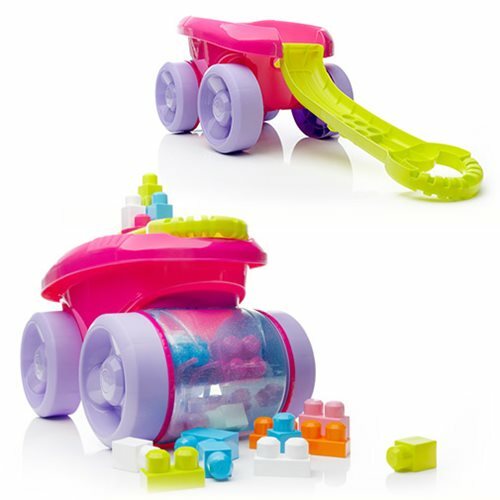 Your little builder can expect lots of fun surprises with the Mega Bloks First Builders Block Scooping Pink Wagon Vehicle! This colorful wagon combines classic wagon play and construction fun with a block-picking surprise, as your little one can push to pick up the included First Builders blocks! Watch the blocks spin inside the clear compartment when your little one pushes the wagon along on its big sturdy wheels. Or, they can pull it along using the easy-to-grip folding handle. Dump the blocks out and use them to build anything your little one can imagine. You can even build directly onto the wagons handle! With so many ways to play, your little one will love rolling and building with this block-picker wagon! Includes 20 pieces. Ages 1-5.